put an end to the hostilities of WWI came into effect. structure of our world. 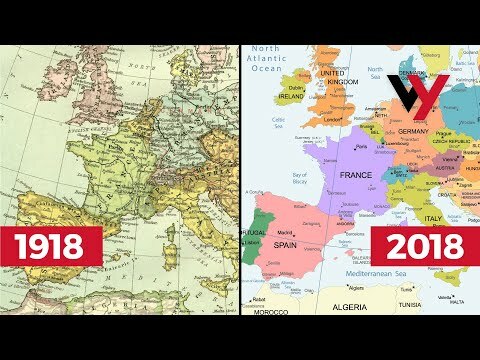 So how exactly has the world map changed in those hundred years? the world, which didn't really have many changes. longer than it has to be, so let's just get started! of the two other Baltic states who had done the same back in February. the Kingdom of Serbs, Croats and Slovenes, although you probably know it as "Yugoslavia"
with their union with Transylvania and neighbouring provinces, which had also been part of Austria-Hungary. A century later and December 1st is still celebrated as their Great Union Day. on June the 17th, when it became its own republic. Europe as a whole. Germany de facto became a republic following the Kaiser's abdication. part of Germany. The latter became complicated by disagreements and led to Polish uprisings. The territory was eventually divided by the League of Nations. to the Triple Entente and later awarded to Greece. and the treaty was never ratified. city, Vilnius, and surrounding territory. Republics of Belarus and Ukraine were ceded to Poland, capping off Polish post-war expansion. Georgia, the latter 3 of which were grouped in the Transcaucasian SFSR. which still exist to this day. 1933 is where the build up to WWII began, with the Nazi party taking control of Germany. Germany. This had been explicitly forbidden by article 80 of the Treaty of Versailles. afterwards in the 'First Vienna Award'. the Baltics, which, unlike most of what happened in WWII, was not reversed afterwards. disregarded after the war, I'm going skip right ahead to 1945.
of its pre-1938 territory. The annexations of Austria and Czechoslovakia were also reversed. borders completely redrawn, losing a lot of its pre-war eastern territory to the Soviets. became divided among the victors of the war. republic, made up of 6 constitute states. as two separate German states were established. an independent country, as the Allied occupation ended, an entire decade after the end of WWII. after yet another referendum affirmed the people's wish to be part of Germany. Cyprus was proclaimed, and the dispute remains unsettled to this day. a new constitution at the end of the Bosnian War. and are still unrecognised states to this day. became their own independent countries. over the region. The international community is split on the issue of Kosovo independence. to Ukraine from Russia in 1954 when both countries were soviet republics. European colonial rule: Ethiopia and Liberia. - to Britain, France, Belgium, and the recently independent South Africa. by terminating their protectorate over them. as compensation for Italy not receiving any of Germany's colonies after WWI. independent nations to the present day. liberated, as the local forces were supported by British and French troops. the African continent began to take its modern form. Somaliland with the now-expired Trust Territory of Italian Somalia. archipelago Zanzibar, forming the country of Tanzania in 1964. 1976 as the Sahrawi Arab Democratic Republic. but it wasn't not recognised until as late 1980.
whether or not it displays South Sudan as an independent nation! Britain, after Afghanistan invaded British India and they fought a very brief war. administered through the newly created League of Nations in the Mandate system. to be granted to the French. of Iraq and the Emirate of Transjordan. Iraq became independent just 11 years later. as the Kingdom of Saudi Arabia in 1932.
itself and joined Turkey as Hatay Province, which is still part of Turkey to this day. during the course of the Second World War. and Syria gained their independence from the British and French mandates. while the Egyptians were in control of the Gaza Strip. but this only lasted for 3 years as Syria seceded from the union following a coup d'état. their independence as South Yemen. influence in the Middle East. Bahrain, Qatar, the United Arab Emirates, and Oman. with their full withdrawal being completed in 1982.
still split on the question of Palestinian sovereignty. Yemen, really, united to form the Republic of Yemen. in the North Pacific to Japan after WWI. in the area called 'Manchukuo'. states on the mainland, merging them in 1940.
and such minor islands as we determine". even before the First World War. changed to 12th of June, the date of their independence from Spain in 1898.
beliefs, with India being predominantly Hindu, and Pakistan predominantly Muslim. In 1948, both Burma and Ceylon (renamed Sri Lanka) gained their independence from Great Britain. change to their original common border. Unlike Germany though, Korea still remains divided. a complicated and controversial political status. to Vietnam, and provisionally split it between north and south. For years, the border area between India, China, and Pakistan had been cause for dispute. it also being claimed by India. days later, it was invaded by Indonesia, who then annexed it after the conflict was over. In the same, after nearly 20 years of conflict, the Vietnam War came to an end. The US-backed South Vietnam lost to the communist north, and Vietnam was reunited. time from Indonesia, after a 3-year UN transitional administration. and exclaves. The border was drastically simplified in 2015. Netherlands, and three South Pacific Nations from the United States in more recent years. of the will of the people, and without any bloodshed. don't know how. Maybe you want your own online store. With Squarespace, it's easy. You can create a beautiful website with templates from world-class designers. events or projects, or just turn a cool idea into a website. use the offer code WONDERWHY to save 10% on your first purchase. China has proposed new draft laws on vaccine management which seek to tighten the supervision and management of how vaccines enter the country's market and will also require stricter management of their production, research and distribution. Find out how David Chang arrived at his most outlandish-sounding bāng, the breakfast sandwich made with lardo-basted, spit-roasted mortadella. Powerful action tonight by Stacy Bannerman who confronted George W. Bush and returned her Freedom Medal. Portfolio Management Schemes products are different from off-the-shelf (OTC) MF ones by two broad measures: operational structure and objective. Unification, Division, and Reunification of Germany The Entire History of France in 23 Minutes The Most Complex International Borders in the World Part 3 10 Crazy Railroad Tracks That Will Amaze You What's the difference between Latino and Hispanic? Macedonia Naming Controversy What on Earth Happened to the Old Europeans? Pre-Indo-European History of Europe Secrets of the Great Plague 5 Biggest Mistakes Of All Time Here's Why My Cheap Audi R8 was TOTALED! Major Factory Flaw Made my R8 Salvage!